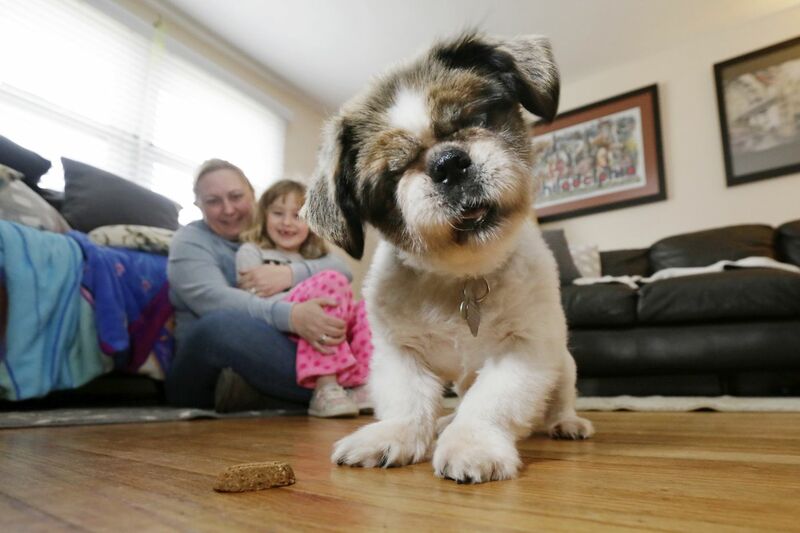 Lucie Greco (left) and her daughter Isabella, 7, laugh as their 14-year-old Pekinese Chester plays with a treat in their home in Malvern. "He was a spunky little thing," said owner Lucie Greco, a Malvern dog groomer. "Always on the go. Just a happy soul." But last month, the little Pekingese turned 14 – up there in dog years. Lately, Chester has been having house-training "accidents," Greco acknowledged delicately. He never used to. At times now, he seems a touch confused, like the other morning when Greco woke him a bit too quickly. Chester nipped her. "That's why I think he's getting a little, you know, dementia," Greco said. "He's going a little off." Bark, bark, against the dying of the light. Dogs and cats, like their human companions, can suffer the ravages of cognitive decline, also known as senility or dementia. There's a body of research that says it also appears to happen in the wild to some species of mammals and birds, even insects. However, animal experts add, creatures living in unprotected environments probably don't survive very long with serious cognitive loss. Domestic animals, especially those that share our homes, are another story. Advances in veterinary medicine have made it possible for pets to live longer, just as medical breakthroughs have extended people's lives. Much of the research has focused on dogs; their decline has its own name – canine cognitive dysfunction (CCD). "Certainly as we see dogs get older and older, we do see a higher proportion of them with signs" of CCD, said Evelyn Galban, associate professor of neurology and neurosurgery with the University of Pennsylvania veterinary school. In some dogs, cognitive dysfunction can start to manifest as early as 8 years of age. It's not as common in cats, but when it does occur, it tends to happen at age 15 or over, Galban said. Like people, animals with dementia can have times of total lucidity, but also periods of being confused and disoriented. Henry, my family's dearly departed beagle-basset mix, started slipping away for unauthorized walks late in life. When we responded to calls from our neighbors to come get him, he always looked very relieved to see us — and totally baffled about where he was and how he got there. "The owners will say, 'He just stands out in the yard and stares, and we can't get him in,' " Gandler said. Cognitive decline and the behavioral changes that can go with it can be perilous for pets. It's not unusual for senior pets to be surrendered to the pound or even abandoned. While some owners will seek to prolong their pets' lives, others may feel that they don't have the resources to care for animal with cognitive issues. Take Darkness, for example, a 13-year-old black cat surrendered to Philadelphia's Animal Care and Control Team. ACCT spokeswoman Morgan Polley said Darkness' owner, an older man, required caretakers. All those strangers upset the cat to the point that she started to relieve herself outside the litter box. Darkness is available for adoption through the Animal Care and Control Team of Philadelphia. "I think she just really needs a quiet home, and having a home that all of a sudden became too loud got a little too much for her," Polley said. ACCT doesn't provide veterinarian care, but Polley said they keep a list of vets that will reduce costs if that will help people from giving up pets for health reasons. Senior pets are the express mission of such organizations as Philadelphia's City of Elderly Love Rescue. "I'd estimate about one in five of the animals — both dogs and cats — we rescue suffer from some form of cognitive dysfunction, and we're coming on 600 saves. So that's hefty," said board member Ashley Foresta. One of the animals they're hoping to place is Tex, an affectionate, 10-year-old pit mix. Tex was developing cognitive dysfunction and was barking at night for no apparent reason. But Foresta said he is "making great strides," thanks to a combination of reward-based training, food puzzles, and a hemp-based medication containing CBD, or cannabidiol, a non-intoxicating component of cannabis. She said it seems to be helping with the dog's anxiety and subsequent problem behaviors. Tex, a Pit bull-Labrador mix, is available for adoption through the City of Elderly Love Rescue of Philadelphia. While dementia can't be cured, there are things that may help manage symptoms. "What we're trying to do is deal with the side effects and behavior," Galban said. Creating a routine of exercise, even one that's very gentle and minimal, is also a good idea, but it should be done in a way that doesn't create more anxiety. And while there isn't sudoku for pets, animal brains benefit from new experiences and learning new things. Galban suggested checking out pet toys designed to help give your pet some mental exercise. "To keep the brain healthy," Galban said, "you really need to challenge it." In Malvern, Chester the Pekingese has chosen his favorite playmate to keep him active. That would be Lucie Greco's mother, Jane Knipe. She moved from England to live with her daughter's family several years ago. Chester is with her all day while Greco works at her grooming shop and pet day care, Lucie's Barkingham Palace. Chester sits on the couch with Jane Knipe in her daughter’s home in Malvern. The dog sits beside Knipe on the sofa when she watches television, accompanies her outdoors, and cuddles next her at bedtime. Knipe, 69, a retired nurse's assistant, cared for people with dementia. She's fine with Chester. "He can get a bit snippy," Knipe said. "But you know what? I think I may get snippy when I'm his age." Sometimes, when he's pouncing on a dog treat, she catches a glimpse of the old Chester. "He changes," Knipe said. "He is like a puppy." Some things, though, don't change. She added: "He's a good little dog."